My name is Magdalena Paśnikowska. I hold a Master of Arts degree from the Institute of English Studies at the University of Warsaw. The Polish Ministry of Justice granted me the title of sworn translator of English and Polish in 1998. 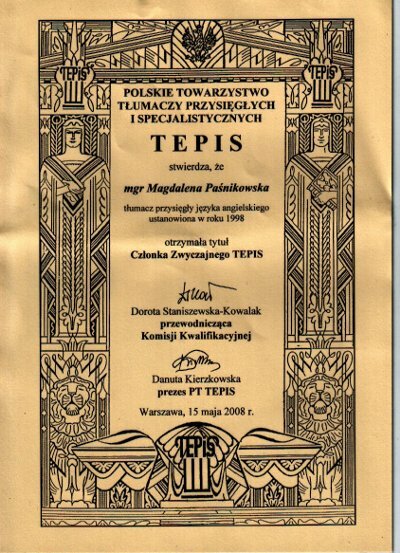 I am a full member of the Polish Society of Sworn and Specialised Translators TEPIS. 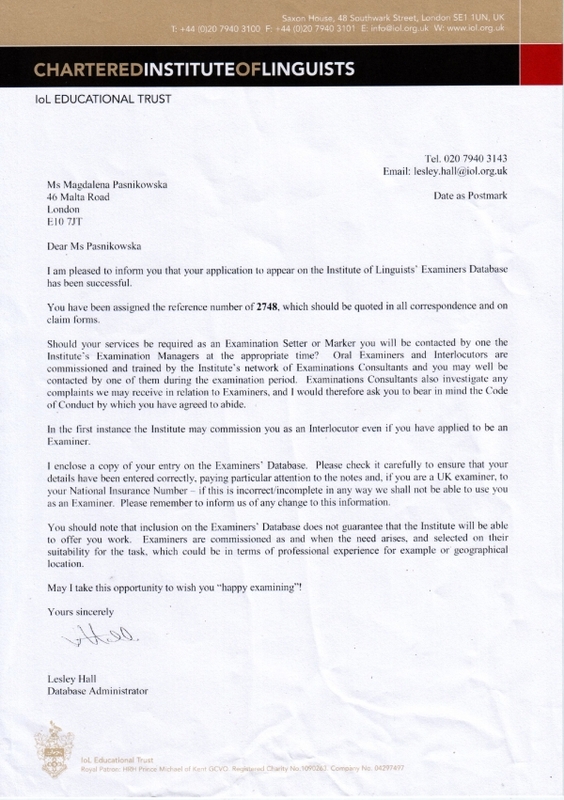 I am also registered as a Polish examiner at the Institute of Linguists Educational Trust. I have over 20 years of professional experience in translation and interpreting. I have been living in the United Kingdom since 2004. Among other things, I work as a community interpreter for the London boroughs of Redbridge and Enfield; I also perform community interpreting for the LB of Waltham Forest through the agency Language Line. You can find further details of my professional career in the Portfolio section. My offer includes both sworn translation (officially stamped in line with the requirements of Polish law) and certified translation (in the typically British format, accompanied by a certificate). I am fully qualified to perform translations for the local authorities, solicitor's offices, NARIC, banks, insurance companies, or other official institutions. How to place an order: As we are living in the internet age, it is probably easiest for you to email me a scan or clear digital photo of the document you wish to have translated. As soon as I receive it, I shall get back to you with the quote, term of delivery, and payment details. I will then send the finished translation via First Class mail to the address provided by you and in the time frame agreed. How much does it cost? The rates for individual services are shown below. Please note - I can only supply a binding quote after I have seen the document in question. How long does it take? In the case of standard documents the turnaround time is usually 3 working days from the date of payment. There is also a next working day option. Once I have seen the document(s) to be translated, I will inform you of the actual date of posting. What are the payment methods? The easiest way is to pay online using any debit or credit card, or via your PayPal account. You can also arrange a bank transfer. All the details are here. Please note: the delivery term is counted from the date your payment reaches us. The certificate attached to each translation confirms that it is a true and accurate rendition of the original, as required by British legal regulations. Birth, marriage, and death certificates, diplomas, school certificates, insurance documentation, correspondence. Check our prices and order now! Birth, marriage, and death certificates, diplomas, school certificates, insurance documentation, official correspondence, etc. Business negotiations, seminars and training sessions, GP and hospital visits, legal visits, social services, housing, education, etc. All services are duly invoiced. I am not a VAT payer.